The Kameha Grand Zurich Hotel is thrilled to launch an innovative Space Suite designed by German artist Michael Najjar, who hopes to be the first contemporary artist in space in the near future. Immersed in an out of world experience, guests will be exhilarated by features such as Universe motifs, a zero gravity bed and steam bath with artistic views across space. With this new suite, Kameha Grand Zurich continues to transcend standard approaches to travel, going above and beyond the needs of business or leisure travellers visiting Zurich by offering them a glimmer of life in outer space. The Space Suite also finds perfect alignment with the sensory experience flowing throughout the hotel, creating a place where fantasy and reality converge, full of innovation and freedom of thought. Combined with eleven other awe-inducing themed suites and Swiss design from world-renowned creative Marcel Wanders, guests are sure to be delighted at every turn. 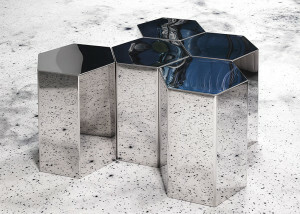 The creative flair behind the Space Suite stems from no ordinary designer. Michael Najjar is not only a visual artist but also an adventurer and future astronaut who has undergone intensive cosmonaut training in Russia, including jet fighter flights in the stratosphere, Zero G and centrifuge training, space walk simulation and computer simulations on the Soyuz spacecraft. Najjar will also be the first contemporary artist in space as one of Richard Branson’s Virgin Galactic Pioneer Astronauts. dedicated to space travel, Najjar’s renowned art is showcased in museums, galleries and biennials worldwide, interpreting science, history and philosophy into visions and utopias of future social structures. With his unique experience and artistic talent, Najjar has been exclusively commissioned to design the Space Suite for Kameha Grand Zurich. The idea behind this is to immerse guests or ‘crew members’ in the atmosphere of a space station, tapping into various elements of perception to enliven the experience. 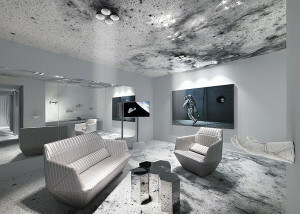 Najjar’s personal touch is also reflected in three original artworks from his most recent project ‘outer space’ as well as the Universe motif, which follows through from the carpet to the bath, rocket engine inspired spot lights, as well as exclusive novels, films and audio books about space travel. Upon entering the Space Suite, an automated female voice inspired by John Carpenter’s science fiction film ‘Dark Star’ welcomes the crew member in 8 different variations, confirms their login and offers handling instructions for the Suite. Guests are then fully immersed in space with a Universe motif printed on the carpet featuring high-res images from the Hubble Space Telescope which have been stitched together to create a new, fictive Universe. 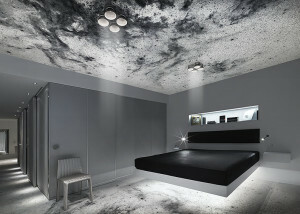 Bringing in Najjar’s abstract flair, the image is then inverted – space is white, stars are black. Other quirky features include spot lights inspired by rocket engines and a space glove where crew members can place their phones or key cards. Meanwhile, the window in the ‘living module’ has been covered entirely by mirror – a simulation which interferes with real space. This tests the crew member’s perception, making them question the room they are really standing in. The steam bath follows through with the Universe motif and features a small window which presents a view into space and down on Earth. The light above the bath tub displays the surface of Saturn’s moon , which scientists assume hides a gigantic ocean under its ice surface. 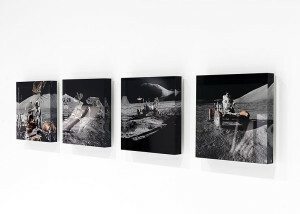 Four small square pictures are installed in the dressing room to show the famous Lunar Rover and Astronauts from Apollo 15, 16 and 17 on the moon’s surface. Meanwhile, the window in the ‘living module’ has been covered entirely by mirror – a simulation which interferes with real space. This tests the crew member’s perception, making them question the room they are really standing in. The steam bath follows through with the Universe motif and features a small window which presents a view into space and down on Earth. T he light above the bath tub displays the surface of Saturn’s moon Encleadus, which scientists assume hides a gigantic ocean under its ice surface. Four small square pictures are installed in the dressing room to show the famous Lunar Rover and Astronauts from Apollo 15, 16 and 17 on the moon’s surface. by the Russian Soyuz and the American Space Shuttle and lastly, the futuristic Spaceship Two by Virgin Galactic on which Najjar will fly into space. s linkages between space, gravity and the human body. A cosmonaut levitates above the ground in what seems at first sight to be an industrial environment. Yet the view of the Earth through a porthole dislocates the viewer’s perspective and questions the relationship between real-world and fabricated reality. The work draws on a cosmonaut training session taken by Michael Najjar in December 2012 at the Yuri Gagarin Cosmonaut Training Centre in Star City, Russia. space voyagers portraits the space crew TMA-14M who left earth in a Soyuz Spaceship on 25th of September 2014. After one year of intense training and preparations, this artwork captures the incomparable emotions felt by a Cosmonaut or Astronaut on launch day. Following an official farewell ceremony lead by the head of the Russian space agency and an Orthodox Priest, the artworks aims to illustrate an unparalleled human experience – the moment the Cosmonauts farewell Earth and enter their spaceship for the next 6 months. orbital cascade_57-46 visualises the sheer quantity of defunct objects in the Earth’s orbit from 1957 to 2046. This includes everything from spent rocket stages and old satellites to fragments resulting from disintegration, erosion and collisions. Currently there are about 600,000 objects larger than 1 cm in space, orbiting Earth at a velocity of approximately 28,000 kmph and posing a severe threat to satellites, space stations, and manned space flights, known in aeronautics as the ‘cascade effect.’ This visualisation was realised in collaboration with the Institute of Aerospace Systems/TU Braunschweig. 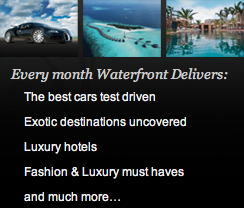 Kameha Grand Zurich (www.kamehagrandzuerich.com, +41(0)44 525 5666) offers the galaxy getaway 2 night package from 1845 CHF/£1282 per night. 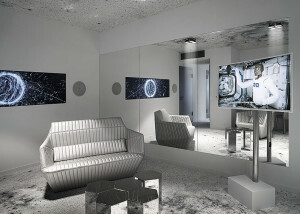 This includes B&B accommodation in the space suite, space amenities on arrival, 1.5 hours body flying/1 hour flight simulation in an A320, personally signed ‘outer space’ book by Michael Najjar, opportunity to visit Michael Najjar’s Berlin studio to meet him personally and a designer art gift to take home. Subject to terms and conditions.